Buying a new home can seem like a daunting task. That’s especially true if it’s something you’ve never done before on your own. 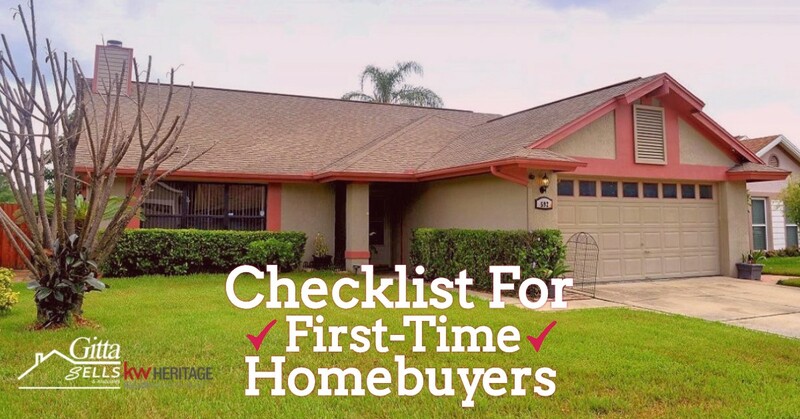 As a first-time homebuyer, it can be a challenging, confusing, and sometimes overwhelming process — so much so that it can be a challenge to figure out where to even start. At Gitta Sells & Associates, we want to help you find your dream home — even if you are a first-time homebuyer. As the premier Lake Mary real estate agents, we have the experience and know-how to help you find the right home and make the purchase with as little stress as possible. That’s why we put together this blog to help you better understand the process from start to finish. Keep reading to learn more about the Lake Mary real estate process and get started on finding the home of your dreams today! Step 5: Inspect & Close! Unless you have recently come into an abundance of wealth, chances are that you are going to have to get a mortgage loan for your first home. With that being said, there are a number of factors that go into play which can determine how much you can really afford. One of the very first things any first-time homebuyer should do is to work on their credit score — whether that means paying down debt, making on-time payments, or establishing more credit. That way, you can qualify for a better home loan with a much more budget-friendly interest rate. In addition, it’s important that you know how much you can afford on a monthly mortgage payment — plan your budget accordingly and make sure that you have enough to make each payment while also living a lifestyle to which you are accustomed. Once you have a fairly reasonable idea about how much you can afford and where your credit stands, it’s time to head to the bank to get a pre-approval. It’s typically best to shop around between a handful of lenders, typically between three to five, to ensure that you are getting the best interest rates and best package for your situation. Once you know how much you are pre-approved for, the home search can begin in earnest. Finding a realtor is another important aspect of the home-buying process. A friendly and trustworthy real estate agent will walk you through the process and go to bat for you to ensure that you are getting a good home at a fair price. Your local real estate agent can also help you search for lenders, find homes for sale in your area, and even take you on individual tours or open house events. Once you find the right home, your agent will work with the seller’s agent to negotiate a fair price and terms, and ultimately settle on closing costs. Finding the right home shouldn’t be a quick process. You want to make sure you are settling into a home that you can afford, for one, but also one that is in the right neighborhood. The Lake Mary real estate team at Gitta Sells & Associates can help you find exactly what you’re looking for as a first-time homebuyer — whether it’s a new construction home, a waterfront home, or a gated community home. Browse our site to see Lake Mary real estate for sale. The final step of the process involves getting an inspection of the home (to make sure everything is in safe, working order) and to get the home appraised (to ensure that you are buying for a fair price). Once the inspection and appraisal comes back, it’s time to close the sale! This means it’s a done deal and you are essentially the proud owner of a new home. You will then sign the promissory note, take ownership of the deed, and then get the shiny keys to the home of your dreams! Ready to get started on the home-buying process? Contact the pros at Gitta Sells & Associates, your trusted Lake Mary real estate team! What do you need to know as a first-time homebuyer? Read our blog for tips and contact Gitta Sells to find your own slice of Lake Mary real estate heaven.